Winter Warmth - Sweet Potato Enchiladas. This recipe was inspired by a dear friend, and has adapted over many iterations into the recipe you see below. The gorgeous sweets and warming flavors bring such joy and beauty to this meal. The bright purple is appropriate for this time -- the day after Imbolc (celebrated on Feb 2 in North American, Feb 1 in Ireland to honor the deity Brighid). The origin of Imbolc from the Pagans -- a holiday that celebrates the halfway point between the Solstice and Spring. It’s like the ultimate hump day. We celebrate with bright colors, acknowledging that the light of Spring is soon to come. Cooking is one of the many ways I honor my Yin and Kapha energies. I am a nurturer -- and feeding my loved ones is my favorite way to enact this quality. This is the way I make these delicious enchiladas at home, but feel free to substitute ingredients based on your preference and lifestyle. I will offer suggestions with each step. Soak 1 cup black beans (dry) in cold water overnight. You may add a dash of baking soda if you are like me and have a hard time digesting legumes. This breaks down the proteins and allows easier digestion. The sweet potatoes take about 45 minutes to cook. I like to prepare them the night before I make this recipe to save overall cook time (and to have them with my eggs the next morning -- two meals with one prep!). Preheat your oven to 400℉. 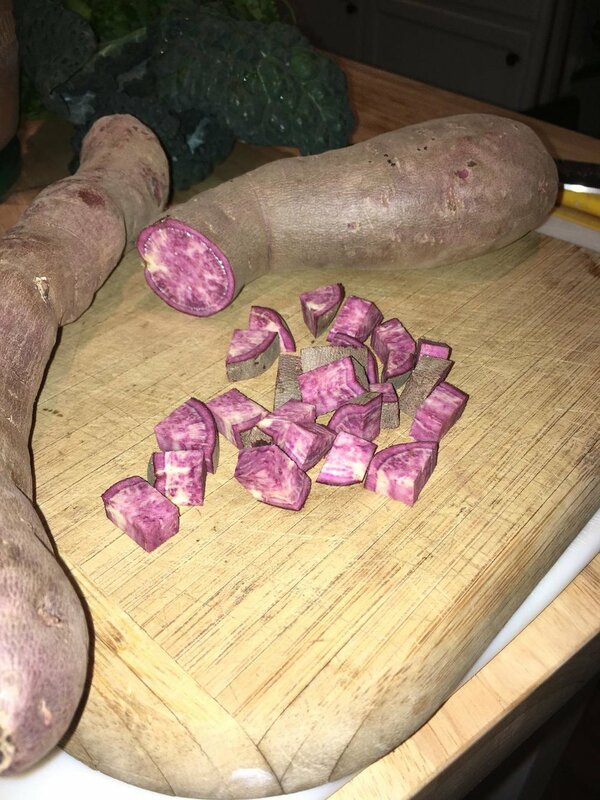 Dice the purple sweet potatoes into ¾-inch cubes. I use purple sweets because they are so gorgeous. I love adding color to my cooking. The more colors we can eat in our vegetables, the wider array of nutrients to nourish our bodies. Place your sweet potatoes in a large pan. Coat with oil (I use avocado and coconut oil). Dash about 1-tablespoon of chipotle powder. Salt and pepper to taste and put in the oven for 35 minutes, or until soft. Save in the fridge overnight and use tomorrow for cooking! Drain and rinse your black beans and before you begin cooking. They will take about 50 minutes. To cook, put in a small saucepan and add water so that it covers an inch above the black beans. Add a dash of cumin, salt, and pepper (and any other spices you like!). Cook for 45-50 minutes. Set aside to cool. In a skillet, sautee garlic and ½ of your onion until transparent. Add in 1 lb ground turkey and brown thoroughly. Set aside to cool. Once your filling ingredients (ground turkey, beans, sweet potatoes) are prepped, combine them into a large bowl and add green chilies. You want this to be cool enough to touch, as you will build each enchilada. Warm your tortillas in the oven or microwave. Do not skip this step! Warming them ensures they will not fall apart as you build them. In a large casserole dish, pour green enchilada sauce to cover the bottom of the pan ¼ inch deep. Begin rolling your enchiladas up by placing ~3 tablespoons of filling mixture into each tortilla and wrapping it up tight. Place them in a row in the bottom of the pan. They do not have to be perfect! Once they are all cozied in the casserole dish, cover with enchilada sauce. You may need to use another can, depending on how saucy you like it! Top with shredded cheese and pop in the oven uncovered for about 40 minutes, or until cheese is slightly browned and bubbling. Use a blender or food processor to blend 2 cloves garlic, ½ lime (juiced), 1 cup cilanro, 1 tpsn cumin, and 1 cup greek yogurt to create the topping. Once enchiladas are ready, pull from oven and allow to cool for about 10 minutes. Drizzle yogurt sauce over the top and garnish with thinly sliced onion and cilantro. Dish up and enjoy! Soak black beans in cold water + 1 tablespoon baking soda overnight in fridge. Prep sweet potatoes the night before to save time. Dice, coat in coconut and avocado oil, chipotle powder, salt and pepper, and cook at 400 degrees for 45 minutes. The next night, when you are ready to cook, start by cooking the black beans. Drain and rinse, fill pot with beans and cold water, 1 inch above the black beans. Simmer for 50 minutes. Sautee ½ onion and garlic, add ground turkey and brown thoroughly. Salt and pepper to taste. Put all filling ingredients into a big bowl: green chilies, beans, ground turkey, and sweet potatoes. Warm tortillas so they do not fall apart. Add ½ can of enchilada sauce to bottom of a casserole dish. Build enchiladas by adding 3 tablespoons of filling into each tortilla. Roll and place them side-by-side in casserole dish. Top with the remaining enchilada sauce. If you want them saucier, use sauce from an additional can. Top with cheese and bake for 40 minutes, or until cheese is slightly browned and bubbling. While cooking make the yogurt sauce by blending ½ lime, 1 clove garlic, 1 tablespoon cumin, cilantro, and 1 cup yogurt in a food processor or blender. When enchiladas are cooked take out and let cool for 5-10 minutes. Top with yogurt sauce, thinly sliced onions, and cilantro. Enjoy! Keep an eye out for more recipes! Life exists of rhythms and tunes; ebbs and flows that vary daily, monthly, and yearly, and even over many years. The Solshine team uses tools that help us tune into the present rhythms. When we are in sync with the rhythm we eliminate burnout and decision-making from a place of fear or scarcity. With known boundaries of when to push and when to recede, we move with the fluctuations of life instead of against it. If we practice listening to the cadence of life we can make decisions from an informed place. We can optimize on periods where we are called to work as well as fully retreat into rest, honoring this yin and yang of life. For example, Winter is a season that invites a calmer melody. The shortened hours of sunlight relieve us of long, full days. Ayurveda is an ancient science from India, it observed the elements in the world, in foods, and also in the body, it discovered through observation the intimate connection between body and mind. Ayurveda suggests a particular diet and routine to compliment this environment. We then zoom in even closer as we examine lunar cycles. Each phase of the moon has a different flavor. For example, even in winter when we have a fuller moon we are encouraged to find our edge, to create, and expend more. This is because when the moon is bright in the sky there is more energy available to us. Think about summer days when the sun is out for longer periods of time, often marked by lots of plans BBQs, hikes etc, it is the natural urge to do more when there is light from either the sun or moon. I know personally, using the moon to coordinate my physical activity provides a balanced agenda, for example when the moon is fuller I will attend a hot yoga class or vinyasa flow, something that I know will challenge me and help to find my edge. I have discovered that I can be a bit lazy, but when I know that the waning moon approaches, my slower pace is within sight and becomes all that much sweeter after staying with my edge during the waxing moon. Zoom in even further and you find that the 24 hours of our days are attributed with optimal work/rest times. I use the Ayurvedic cycles of the day, but there is also the Chinese Medicine cycle to reference as well. The cycles of the day are associated with the Doshas, aka the elements. Vata = air and ether, Pitta = fire with a little water, Kapha= earth and water. Individuals tend to fit into one of these three energies and can be Vata, Pitta, or Kapha-dominant. Vata times of the day which are from 2-6 AM / PM are good for creativity, intentional exercise, and meditation. Pitta times 10 - 2 AM / PM are good for focused work and good for digestion, as the fire is strong within the body. This is not an ideal time for exercise unless it is cooling to the mind and body. Kapha times from 6-10 AM/PM of the day are great for connecting with others, planning out details, and movement -- think high-endurance exercise or cardio. Find your Dosha here! Ayurveda offers simple principles that are easy to comprehend and integrate into your life. It is the law of opposites. When working to achieve balance we identify what is in excess and then bring in the opposite qualities. If it is cold outside we eat warm soups, sip on warm tea, bundle up to bring heat into our lives. We start to notice the qualities of our mind, body, of the food we ingest and we realize the power we hold in every decision. This month Solshine is offering a seasonal recipe. Astrology is the study of planets. Thousands of years ago our ancestors realized there was a connection between the movements of these celestial bodies and our world. We can use astrology like a cosmic forecast. It is another tool to stay connected to the tempo of life. Before we had calendars, we used the stars and constellations to keep track of seasons. It was from observation and study that Astrology was created. You will notice, much like Ayurveda that all of the zodiacs are also associated with an element, fire, water, air, and water. Each of these practices and ways of knowing offers us additional tools to stay in-tempo with the rhythms of life. If we remain open to the channels that communicate energetic callings, we may live a harmonious life, connected to the ebbs and flow of our bodies and our surroundings.